As reported in the New York Times, 30 Oct. 1901, "A new hotel corporation to be known as the New England Hotel Company has been organized under the laws of the State of Vermont, with a capital stock of $500,000 for the purposes of conducting hotels in New York and Vermont. The incorporators named in the papers which were filed in Rutland on Monday, are W. H. Valiquette of the Dunmore, 230 West Forty-second Street; Charles H. Perot of 140 Pearl Street, and Percival W. Clement, Frederick H. Button, and Henry G. Smith of Rutland. Mr. Valiquette, who owns the Berwick Hotel in Rutland, said last night that his first purpose in forming the new company was to lease and conduct a new hotel to be built in the central part of Manhattan, near Fifth Avenue. The exact location he declined to give, saying that the plans were not as yet complete, but that some of the interests back of the company will have to do with the construction of the hotel." The following year, 1902, plans were filed with the New York City Department of Buildings for a $700,000 12-story brick and stone hotel located on the north side of 43rd St. 321 feet west of 6th Ave. The owner of the new hotel was Robert H. Spalding. It was designed by architects Mulliken & Moeller, and it was in operation by 1903 as the Hotel Spalding (sometimes spelled Spaulding) at 127 W. 43rd St. The New York Times, 9 Sept. 1903, pg. 12, reported, "John H. Langton, manager of the Victoria Hotel, has leased from R. H. Spalding the new Hotel Spalding, a twelve-story structure recently completed at 127 to 135 West Forty-third Street. The lease covers a term of twenty-one years at an aggregate rental of about $2,000,000." It may be, however, that all did not go well with the Hotel Spalding. In Sept. 1905 it was sold in foreclosure to the Metropolitan Insurance Company: "A deficiency judgment for $56,779 was docketed yesterday against Edward J. Welch, as executor of the estate of Robert H. Spalding, a builder, now dead, and against Myer Heilman in favor of the Metropolitan Insurance Company. This act follows the foreclosure sale on Sept. 6 last of the Hotel Spalding property, at 127 West Forty-third Street." (New York Times, 29 March 1906, pg. 5). Next in 1906: "The Hotel Spalding at 127 to 135 West Forty-third Street, just east of Times Square, has been sold by the Metropolitan Life Insurance Company to W. H. Valiquette, proprietor of the Hotel Berwick at Rutland, Vt., and until recently of the Dunmore in Forty-second Street, between Seventh and Eighth Avenues. The sale of the Hotel Spalding, negotiated by the Matt J. Ward Company, covers the entire property, both the real estate and the building's furnishings. The consideration in the deal is said to have been $850,000." (New York Times, 27 Feb. 1906, pg. 16). Apparently it was Valiquette and his partners who changed the name from Spalding to Hotel Woodstock. 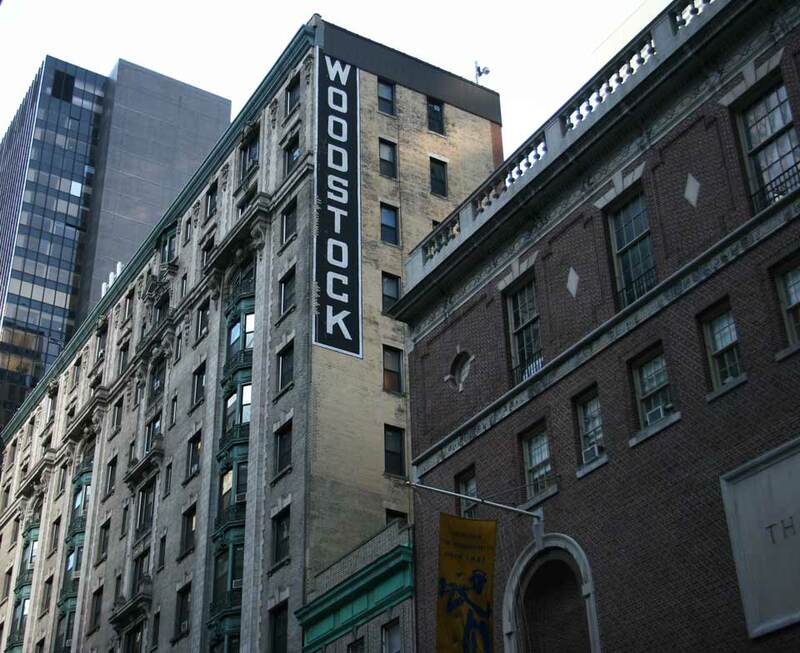 The New York telephone directory listed the Hotel Woodstock at 127 W. 43rd St. starting in 1906. In 1911 the original hotel was expanded with a new addition, adding 40-some feet across the front: "The Woodstock Hotel Company has secured a building loan of $850,000 for the big addition to be built to the hotel on the north side of Forty-third Street, between Broadway and Sixth Avenue. The plot to be improved has a frontage of 144.2 feet by 100.5. The old dwellings have been torn down and excavating work is now in progress. The loan has been obtained from the Metropolitan Life Insurance Company." (New York Times, 29 March 1911). The Woodstock had numerous owners over the years including the Manger Hotels chain and the Fields hotel chain. In 1960 a new owner was Jack Krug: "A thirty-year lease on the Woodstock Hotel, 127 West Forty-third Street, east of Times Square, has been acquired by Woodstock Associates, Inc., Jack Krug, president. The lease was obtained from a group headed by Isaac Pinchuck and Charles Zarucki, who bought the property from the Fields chain of hotels. The aggregate rental involved in the lease is $4,000,000, according to Des Gabor, vice president of the M. Morgenthau-Seixas Company, the broker in the deal. He also said that renovations planned by the lessees included a modern lobby and air-conditioning of all the rooms. The twelve-story Woodstock contains 400 rooms, a restaurant, bar and ballroom and occupies a plot 144 by 100 feet. ..." (New York Times, 8 Jan 1960). Then in the 1970s the Woodstock was taken over by Project Find: "Dismally gray and decrepit, the ground floor of the Woodstock Hotel dulled the street between Times Square and Town Hall for years. But now, having been steam cleaned and stripped of its thick coat of paint, the rusticated limestone base virtually brightens its surroundings. There is more to come, said Cynthia Dial, executive director of Project Find, which owns and operates the 285-unit single-room-occupancy hotel at 127 West 43d Street. "We're going to have trees, planter boxes, colorful awnings and new doors," she said. "You're not going to walk by there and feel this is a distressed property. You're going to walk by and feel there's this very pleasant space. It will clearly help the street scene." The $405,000 renovation, which also includes a new entrance for the disabled, has been designed by Hardy Holzman Pfeiffer Associates of Manhattan. It is scheduled to be finished by October. Project Find, a nonprofit agency that houses, feeds and counsels the elderly, began managing the Woodstock in 1975 and bought it in 1979. The hotel is about 90 percent occupied, Ms. Dial said." (New York Times, 22 August 1993). As of 2014 Project Find continued to provide housing for the elderly at the Woodstock. Officers at the Hotel Woodstock Company in 1915 were Henry G. Smith, William H. Valiquette, Frederick H. Button, and Henry L. Dickerman. Henry George Smith (1869-1942) was born 29 June 1869 in Bridgewater, Vermont. His obituary in the New York Times, 17 April 1942, read in part, "Henry George Smith, Rutland, Vt., banker, died here last night in Doctors Hospital, at the age of 73, after an illness of several weeks. He had served as president and operator of the Woodstock Hotel Company of West Forty-third Street, this city, from 1907 until 1920, when he returned to Vermont to enter the banking business. . . . He became interested in the Woodstock Hotel with several other Rutlanders, including the late Percival W. Clement, one-time Governor of Vermont, and the late William Valiquette. . . ."
William Henry Valiquette (1857-1918) was born 15 March 1857 in Rutland, Vermont. A brief notice appeared in the New York Times, 23 August 1918, as follows, "William H. Valiquette, Vice President and General Manager of the Hotel Woodstock Company, which owns the Hotel Woodstock in West Forty-third Street, and Treasurer of the Hotel Association of New York City, died yesterday at New York Hospital." Frederick H. Button (1869-1924) was born 3 May 1869 in Wallingford, Vermont. An obituary note in the New York Times, 25 October 1924 read, "Frederick H. Button, lawyer, died yesterday at his residence, 11 West Fifty-second Street, aged 55. He was a Director of the Woodstock Hotel Company." The builder, Robert H. Spalding (1865-1904) received the following obituary in the New York Times, 12 Dec. 1904, pg. 9, "Robert H. Spalding, who was a traveling salesman eight years ago, representing a Pennsylvania planing mill and largely dependent upon his salary, died Saturday morning the owner of the Hotel Spalding property in West Forty-third Street, near Broadway, and other valuable interests. On Friday night he was seemingly in perfect health. While entertaining a quartet of professional singers who were rehearsing in one of the apartments of the Spalding, he was stricken with heart disease. At 10 o'clock Saturday morning, five hours after his death, Judge Holt handed down a decision denying the petition of certain of his creditors who sought to throw him into involuntary bankruptcy. When Mr. Spalding made a trip to New York, in 1896, selling wood trimmings, he became impressed with the building opportunities, and, although he had little capital to back him, succeeded in building the Ganoga Hotel, in East Twenty-seventh Street. This he sold advantageously, and immediately built the Collingswood, in West Thirty-fifth Street, at a cost of almost $1,000,000. When the Bradford Realty Company bought the Collingswood, four years ago, he built the Spalding. At the time of his death Mr. Spalding was but thirty-nine years of age. He was a native of Wilkesbarre, where his father was for many years a cashier of the First National Bank. His wife died in the Summer of 1903." This ad for the Hotel Woodstock appeared in the Fall River Line Journal, vol. 34, no. 13, 24 June 1912. W. H. Valiquette was manager at the time. He was also associated with the Berwick Hotel in Rutland, Vermont. The following year this ad appeared in the Hudson River Day Line Souvenir Magazine, vol. XXVI, no. 4, Sept-Oct 1913. The name of A. E. Singleton has been added as assistant manager. Also rates have increased. Room with bath is now $2.50. Another ad for the Woodstock is this one from the Automobile Blue Book, 1917. A later Hotel Woodstock ad appeared in the Polk Brooklyn City Directory, 1933-34. 127 West 43rd Street was designed by the architects Mulliken & Moeller (Harry B. Mulliken (1872-1952) and Edgar J. Moeller (1874-1954)). In addition to several apartment buildings on New York's West side, Mulliken & Moeller designed the Aberdeen Hotel at 17 W. 32nd St. and the Schwarzenbach Building at 470 Park Avenue South. For more on Mulliken & Moeller see Christopher Gray's "Streetscapes" article, New York Times 14 Sept. 2003.